Sidhil News: Sidhil have now raised over £2000 for Forget Me Not Hospice!!! Sidhil have now raised over £2000 for Forget Me Not Hospice!!! We have now raised over £2000 for Forget Me Not Hospice, the target for the whole year is £7,500 which is the cost of running the children’s hospice for 1 day!! Thanks to: Clive Siddall doing the Full Windermere Marathon (even though he was only supposed to be doing half!!) and our office staff for our Dress Down Days!! 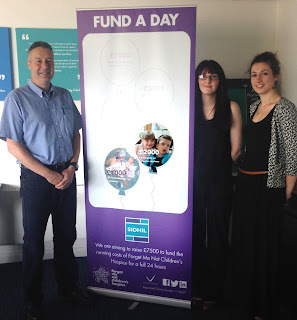 Our Marathon Man Clive Siddall with Vicky and Hannah our fundraising team!! Sidhil would like to wish Tony Craddock Good luck, he is currently training for the Yorkshire 3 Peaks on the 27th June and is hoping to do it in under 6 hours!! Next: The Sidhil International Charity Golf Day!!! A fantastic day with a lot of money raised... Watch this space for more details! !